The tart, bright taste of lemon is like a burst of sunshine for your body, and it can even help you wake up pain free if you know how to use it. Treating your pain with something you probably have at home already will keep you active and out of the doctor’s office. The cause of your specific pain is specific to you. 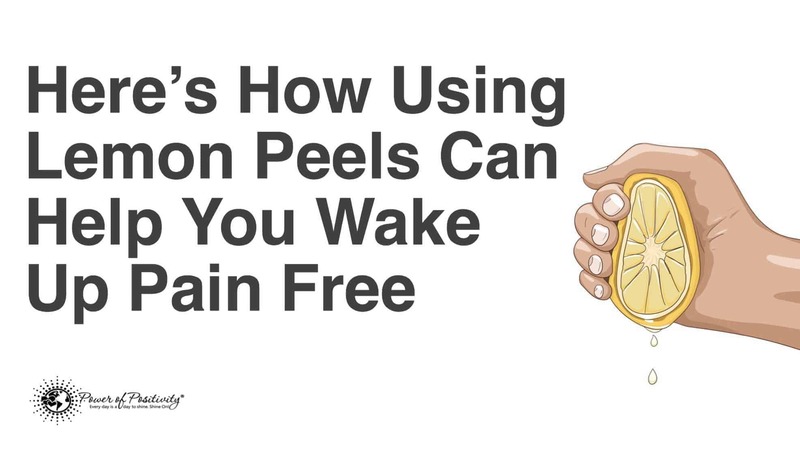 In this article we will be talking about how to use lemon peels to fight the pain of inflammation. Inflammation in the body is the cause of much pain and illness. Inflammation means that the body’s blood vessels are dilated and swollen. This swelling leads to redness, pressure, stiffness and pain. Although pain can be felt anywhere in the body, most commonly the pain of inflammation is felt in the joints. Joint pain can occur in any part of the body that has bone to tissue connection. That means that any one of the 360 joints in your body could be experiencing the pain of inflammation right now. The active ingredient in lemon peels that helps relieve pain is the flavones. Flavones are a molecule in fruit, vegetables, tea, wine and herbs, which often give us a strong taste associated with the food. In lemon peels it is specifically polymethoxy flavones which contribute to the anti-inflammatory benefit that can help you wake up pain free. NOTE: Prior to using lemon peel for pain relief, speak to your health care professional about whether your health concern would benefit from this type of treatment. There are some conditions, such as chronic pelvic pain or individual sensitivities to limonene that could cause an unhealthy reaction. The warmth of your own body heat being retained against your skin will help the lemon peel oil to penetrate into your skin and help your joint pain. Lemon peel can be taken internally and eaten, however, the benefits from the pain-relieving properties of the peel are believed to be best absorbed externally. Some compounds found in lemon peel cannot be passed to the bloodstream through digestion. If you are not concerned with possible interactions, you may try adding a small amount (a pinch) of your grated lemon peel to a glass of water and see if you notice any change in your pain levels. Lemon peels are naturally high in Vitamin C, just like the fruit inside. They also contain Potassium, Magnesium, Calcium, Vitamin B6, Folate, and Iron in smaller amounts. Lemon peels also contain the fatty acids Omega-3 and Omega-6. Lemon peels also have phytosterols. Don’t worry about calories when consuming lemon peel as you would have to eat 6 grams (a whole tablespoon) of the tart stuff to equal a puny 3 calories. Just as you would add lemon juice or a lemon wedge to water, you can also add grated lemon peel to a beverage. Lemon is also a cancer-fighting agent. The same polymethoxylated flavones that help reduce inflammation also help fight cancer. A study found that these flavones inhibited the growth of a several different types of human cancer cells. The citric acid in lemon juice and lemon peels can help eliminate kidney stones. The citric acid helps reduce the likelihood of calcium crystals forming in urine. The calcium crystals can become hard deposits or kidney stones. Kidney stones, when they become lodged in the small diameter urethra can feel horribly painful. Avoiding the pain of kidney stones is an excellent reason to use lemon peels for a pain-free morning. In Traditional Chinese Medicine, citrus peels are used to help with respiratory problems. The lemon peels tend to help with a reduced inflammatory response in the lungs, which can help with problems like asthma and bronchitis. The Vitamin C in lemon peel is also good for preventing scurvy, a disease which is much less common than it used to be before citrus fruit were available year-round. An old remedy for scurvy used to be to mix lemon peel and vinegar and rub it into the patient’s gums. Lemon peel can also help fight fatigue. A review of non-medical approaches to fight fatigue found that lemon peel was used traditionally to help with stabilizing emotions, improving confidence, and keeping the mind fresh.